Production Time: what’s the deal? 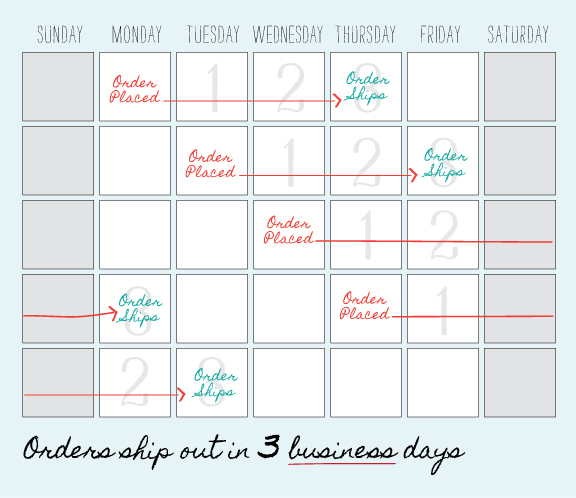 Our customer service ninjas told me that they get a lot of questions about our turnaround and shipping time. In an effort to clarify the matter, I had to have a visual so I figured you creative types would prefer to be enlightened the same way. We guarantee 3 day turnaround unless otherwise noted (i.e., foil takes a little longer so it’s noted in the description on the site). We do NOT count the day that you upload your artwork and send in your order since they come at all hours of the day. Sometimes it happens even faster, we just want to make sure that you have a guideline to work with. A wedding is a mammoth event in people’s lives and being asked to share in the big day is very touching. A wedding invitation can say much more than just the date, time and venue. It is a document that confirms the love two people share and show a glimpse into their lives. 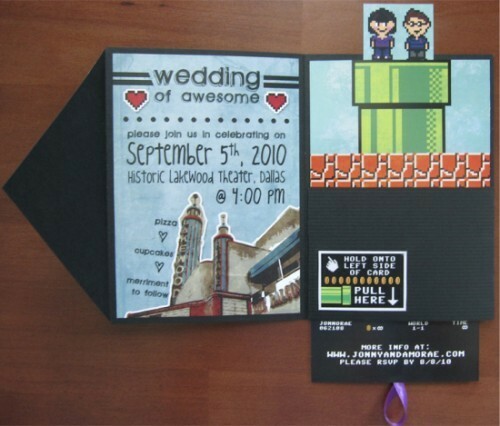 Today we are going to look at some wedding invitation designs. They are being highlighted for their uniqueness and creativity. 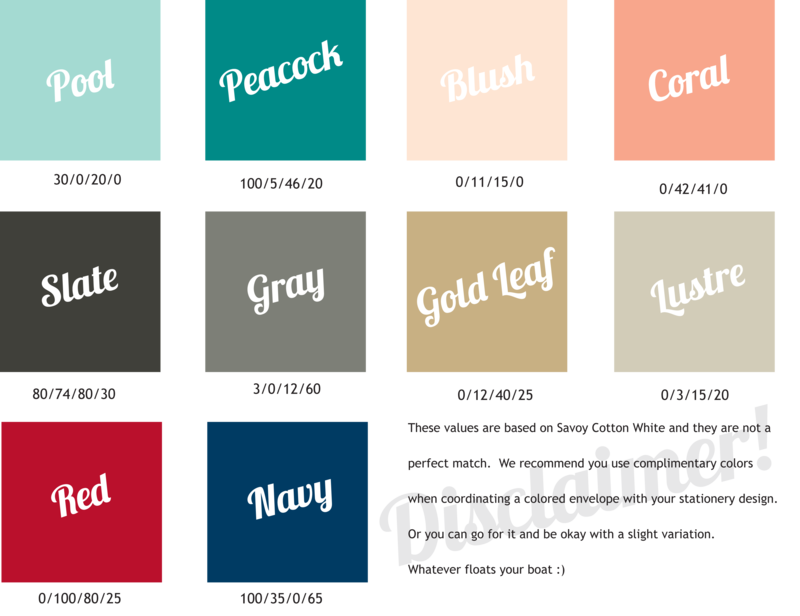 Many of these have been created by designers for a specific couple. The designers have taken into account the lifestyle and personality of those who are soon to be wed. The results, as you will soon see, are quirky, endearing and humorous. 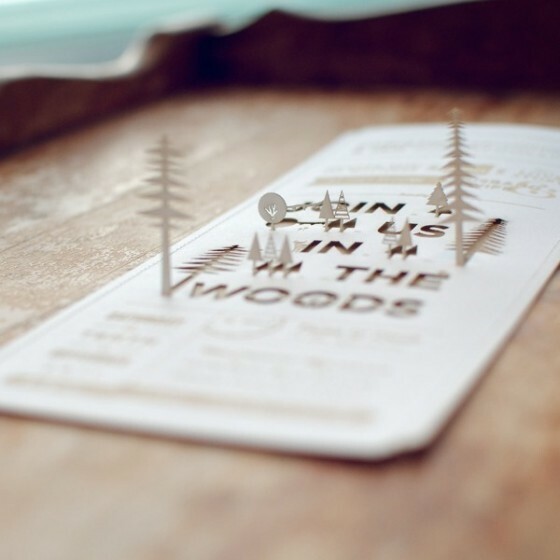 This pop up design by Charlotte Fosdike will become a valuable keepsake long after its use as a wedding invitation has passed. This was commissioned by a couple who wanted to embody who they were into the invitation. They both were adventurous, outdoor people and this really comes across with the trees standing majestically over the written content. This was designed by Bilda Grafiks for Marta and Richard’s wedding – a fact you will learn once you consume the delicious chocolate inside the invitation chocolate box. 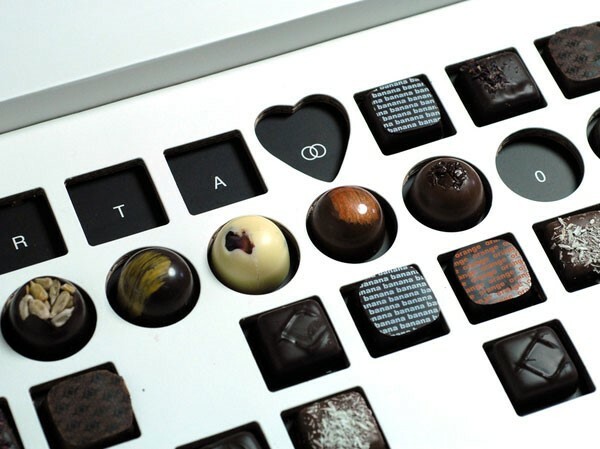 This is a novel idea and helps forge a bond with the forthcoming wedding by attaching it to something we all enjoy – chocolate. Who doesn’t like a little pop culture reference? The Keep Calm and Carry On meme has exploded over the internet. Most people would be familiar with it, which is why this invite by Bruno Vergauwen would have caused a chuckle. The tea jokes, despite being rather cute, make it especially British. This would appeal to people of a certain vintage – who grew up playing 8 bit games. This is particularly charming, because it unashamedly promotes the nerdy side to this couple, which is something they obvious bond over. Extra marks for the interactive element. 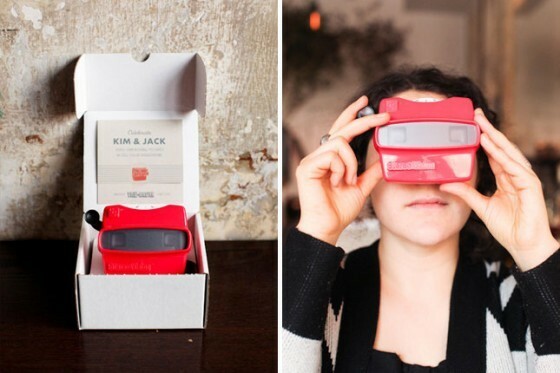 A viewmaster is a toy that allows you to look through a series of images. Many of us had them as kids. 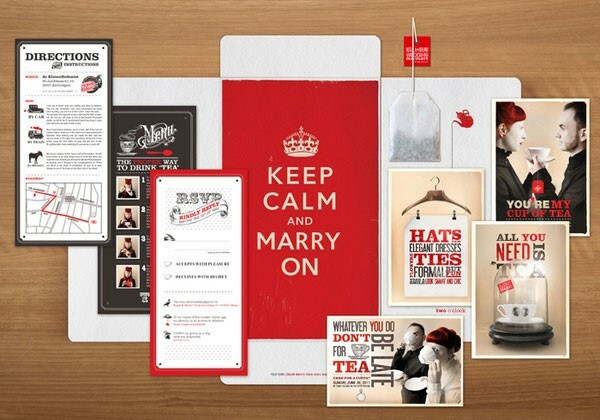 This kooky invitation design allows guests to enjoy a series of images relating to the forthcoming wedding. I think it creates a sense of play we all had as a kid and establishes that the wedding will be unconventional and fun. Who needs a paper wedding invitation? 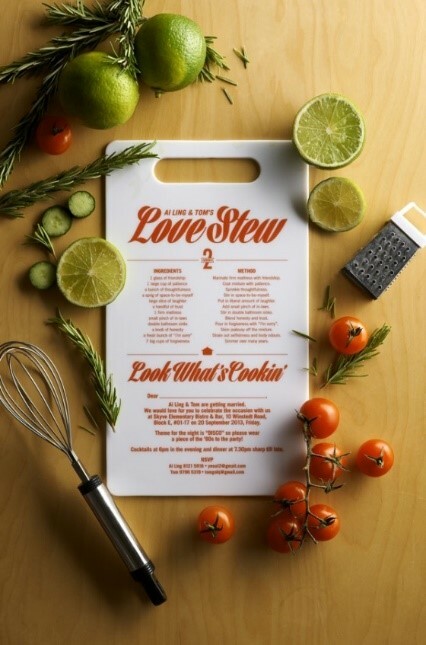 This couple gave their invites out on a small chopping board with a recipe on it. This design is a great example of lateral thinking, because not only does it inform guests about the big day, remains useful as kitchen utensil. This wedding invitation was designed for a jet-setter couple who see themselves as citizens of the world. 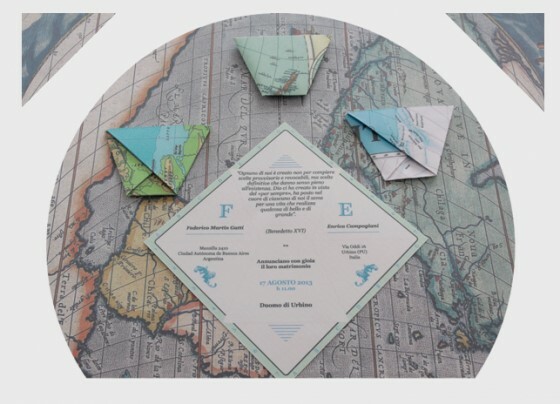 Their love of travel (which they share together) is reflected in these fun origami maps that fold out.